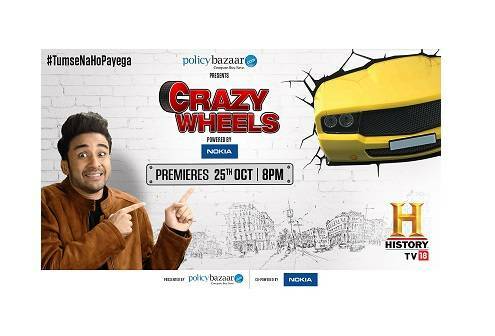 Factual entertainment leader HISTORY TV18 is all set to premier a new show featuring some of the funniest, wildest and most unbelievable things that can happen on wheels. The invention of the wheel is often seen as a pivotal moment in the development of the human race, accelerating travel, commerce, communication and dramatically changing the landscape. However, ever since the first wheels were put in motion, man’s inability to pay attention and desire to show off has led to some spectacular and stupid moments. And now, thanks to the Internet, recent wonders of the wheel have been captured in all their glory for everyone to see. From death-defying motorcycle leaps and a hot tub on wheels, to an unstoppable firetruck and a woman towing a car with her hair, will get to see it all. Crazy Wheels has gathered the biggest, best, fastest and stupendously good, and stupid, moments of vehicular madness ever filmed and has put them together in a pacey series that has the ability to both stun you into silence and make you laugh out loud. Popular host, Raghav Juyal, through his wacky commentary, relives the moments and brings his own brand of witty style to the show. Using his comical timing, he describes what could’ve possibly gone wrong while filming the reference videos that resulted in the maniacal instances being caught on camera. Join Raghav on this funny journey and experience the most astonishing, exciting and hilarious things that happen on wheels.